Trust me, it says something about a book when I can read it on a phone. This is the only book I have ever stuck out reading on my phone. So if minuscule text can keep my interest, surely that says something good. 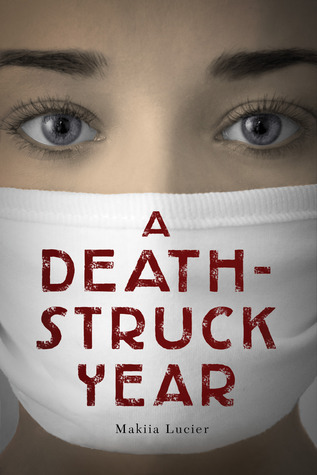 Before starting A Death-Struck Year, I knew next to nothing about the Spanish Influenza. And I call myself a history nerd. So yeah, I learnt a LOT while reading this book and I enjoyed every minute of it. This was one ride of a book. As you will see in the progress/status updates at the bottom of my Goodreads review. You will see that I thought that I nearly threw up my heart at one point. Lovely, eh? I was just stunned. It was horrible and shocking and I felt sick to the stomach for the characters. Cleo was such a great main character because she was somehow likeable, even though she was stubborn and rather foolish. Somehow this only endeared her to me. She was brave and loyal, unafraid to stand up for what she believed was right. Even if she didn’t always choose the right path to achieve this. The reason I’m docking off half a star is because at not one point in the book, was I a fan of the relationship between Edmund and Cleo. I just never really felt it. If you have read the book, hopefully you understand why I’m only leaving off half a star. I was reading everywhere I could – and probably shouldn’t have. I would recommend this to fans of historical fiction and to people with interest in the earlier nineteenth century. Or even if you just want a good book. KABOOM! That onnly leaves one little continent. One little flaw. Makiia Lucier grew up on the Pacific island of Guam, not too far from the equator. She received a bachelor’s degree in journalism from the University of Oregon and a master’s in library studies from the University of Wisconsin-Milwaukee, where she studied literature for children. She’s had plenty of jobs, mostly in libraries, and currently resides in the small college town of Moscow, Idaho. *This post was originally posted on my primary blog, Bookcomet.